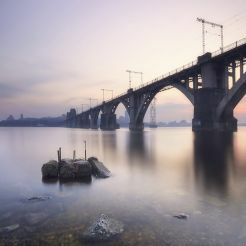 Merefa-Kherson railway bridge in Dnepropetrovsk can rightly be considered the hallmark of the city. For a unique technical characteristics and artistic expression bridge engineering architecture recognized monument of national importance. Bridge construction project GP Perederiy was started in 1912, but the outbreak of the First World War interrupted the construction, during this time managed to build only supports the metal bridge. Only in 1929 resumed the construction of the bridge due to the accelerated pace of construction in 1932. The bridge was put into operation. 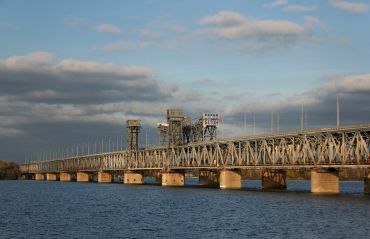 During the war Merefa-Kherson bridge was badly damaged, but in 1951 after a major restoration of the railway bridge acquired its present appearance. 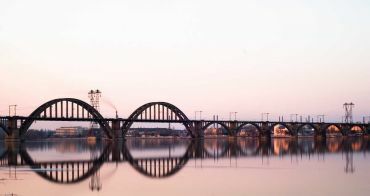 Its total length is 1,610 meters, it is the longest reinforced concrete arch bridge in Europe. 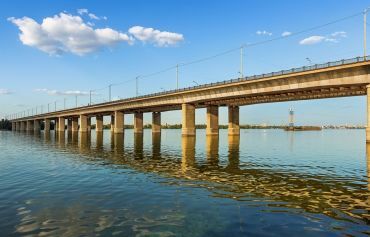 Merefa-Kherson Bridge with its delicate arches harmoniously fit into the modern look of Dnepropetrovsk and became an integral part thereof. 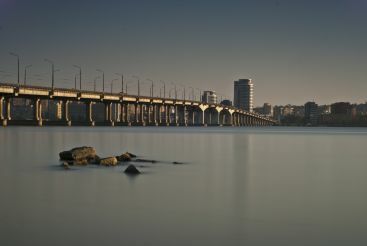 Panoramic view of the bridge is opened with the Dnieper embankment , where they often like to relax, guests and residents of the city.